NEW ORLEANS – It’s Moving Week in the NCAA Division III Indoor Track & Field National Rating Index as we tossed out all preseason marks and only used those turned in during the current campaign. There were notable changes to each set of rankings released Tuesday by the U.S. Track & Field and Cross Country Coaches Association (USTFCCCA). 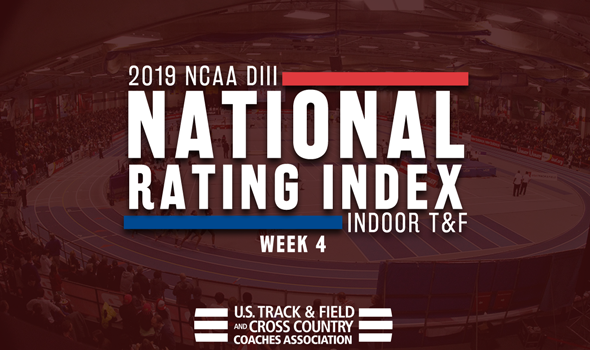 Remember: Be sure to check back in throughout the next month as the National Rating Index will continue to evolve ahead of the NCAA Division III Indoor Track & Field Championships on March 8-9 at the Reggie Lewis Track and Athletic Center in Boston. If you want an idea of how much changed in the Men’s National Rating Index, only two of the top-50 teams remained in place from Week 3. Those teams just happen to be at the top already: No. 1 North Central (Ill.) and No. 2 UW-Oshkosh. This past weekend was pretty good to the Cardinals, who extended their lead over the Titans. Dhruvil Patel and Al Baldonado clocked the No. 1 and No. 3 times nationally in the 5000, while Luke Winder upped his national lead in the pole vault to 5.40m (17-8½). North Central (Ill.) currently has eight marks ranked in the top-5 nationally. UW-Oshkosh kept pace with those teams chasing the Cardinals thanks to the effort of their 4×400 relay team. The Titans’ foursome got the baton around in 3:17.26, which stands as the fifth fastest time in the nation this season. UW-La Crosse and Mount Union continue to play Hot Potato with the No. 3 spot. The Eagles own it this week thanks to Andrew Jarrett’s effort of 20.32m (66-8) in the weight throw that moved him up to second on the Descending Order List. The Purple Raiders got a strong mark in the throws this past weekend as well from Sean Sherman, who is now ranked fifth nationally in the shot put. UW-Platteville rounds out the top-5 this week after jumping three spots from Week 3. The biggest movers in the top-25 this week were No. 8 Wesley (up 17 spots), No. 9 WPI (up 19 spots) and No. 19 SUNY Geneseo (up 41 spots). There were some major changes to the top-10 of the Women’s National Rating Index as only two teams remained in place: No. 1 Washington (Mo.) and No. 6 UW-La Crosse. Williams jumped into the No. 2 spot behind the Bears after a strong performance by their DMR team this past weekend. The Ephs’ quartet got the baton around in 11:50.34, which is the second fastest time in the nation this season. Loras moved up two spots from No. 5 to No. 3. The Duhawks own three marks that are ranked in the top-3 nationally, including two from Gabby Noland in the guise of the 60 and 200. George Fox is back in the top-5 at No. 4 after a pair of strong efforts from Sarah King. The senior tied the national lead in the 200 with her time of 24.34 and improved her national-leading mark in the 400 to 54.27. MIT rounds out the top-5 this week. The biggest gainers in the top-25 between Week 3 and Week 4 were Wheaton (Ill.), Bates and Ohio Northern. The Thunder made some noise as it jumped 28 spots from No. 38 to No. 10. The Bobcats clawed their way up 42 spots from No. 65 to No. 23. The Polar Bears wouldn’t chill out as they moved 31 spots from No. 56 to No. 25.